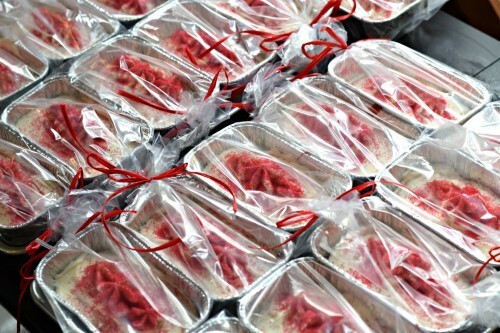 Miniature Red Velvet Cakes make great gifts to share with family and friends! My childhood was filled with wonderful food each and every day, but even with all of that, Christmas baking made the days extra special. I remember vividly the treats we always had, the family recipes: standard candies, special cookies, etc. I make them all for my family now. 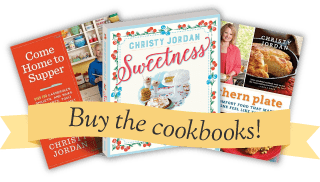 My hope was that my children would have the same wonderful memories and eventually grow to see all of this baking and these special recipes for what they really were – me showing them how much I love them by using my abilities to make their Christmas as special as possible. Of course, even though I used our from-scratch Red Velvet Cake recipe, I did employ a few shortcuts that saved me a good bit of trouble and time so today I’m going to share that with you just in case you find yourself needing to make a few dozen Red Velvets sometime before Christmas! To start with, I got these little pans. I purchased these for 88 cents for five, making them less than 20 cents each. The main benefit of these pans, though, is that it allows me to make 11 cakes out of one recipe of cake batter. Each pan holds about two cupcake worth of cake, which is still a generous serving for one person. Note, these pans are 3.25″ wide, 2″ deep, and 5.75″ long. The next thing I do is completely ignore the part in most recipes where it says to “grease and flour” every single little pan. 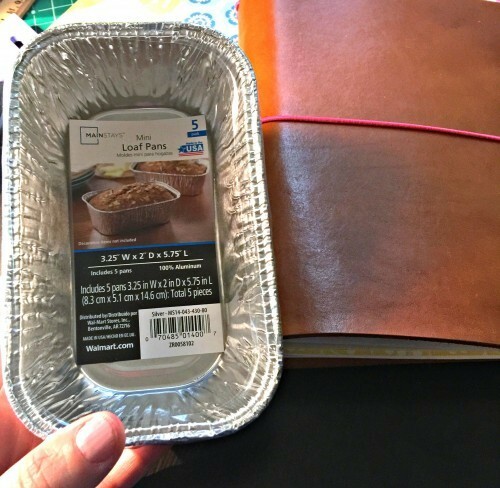 Grease and flour 22 mini loaf pans? I don’t think so. I just spray them with Crisco® instead and they turn out just fine, but with a few seconds of effort rather than several long minutes of effort and mess. I line up these pans on a cookie sheet, 8-10 fit on each cookie sheet. Then, mix up my batter all at once. This recipe is a double one and will make 22 of these little guys if I put 1/2 cup of batter in each pan. They are easy to get in and out of the oven since they are on the baking sheet. Bake these at 350 for 15-20 minutes, or until a toothpick inserted in the center comes out clean. 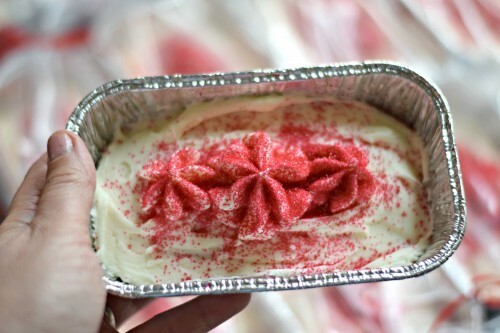 To ice them, I spread a thin layer on top and then put some icing in a bag with a large star tip and just pipe a big star in the center with a smaller one on each side. I sprinkled red sugar crystals over these for decoration but also to prevent the wrapping from sticking. If you let these sit out for about ten minutes after icing them, the icing dries just a little, which also makes packaging easier as well. Packaging is as simple as a clear party treat bag and some red ribbon. These bags are sold in quantities of 20 for about $1, which also helps to keep cost down. I love how easy they are to wrap up for gift giving this way! And just like that, in very little time with not nearly as much effort as you think, I’ve made 22 miniature Red Velvet Cakes! The recipe I used is below, already doubled so that you can make these cakes for gifting if you like! 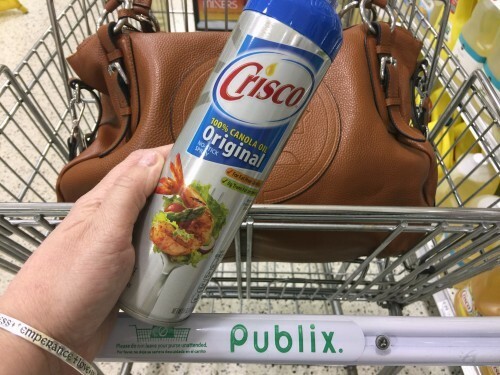 For more information, tips, and recipes using Crisco® products, visit www.crisco.com and if you’d like to have a little fun and get a coupon, visit www.thedessertdebate.com! In a medium bowl, stir together flour, cocoa powder, baking soda, and salt. In a separate large mixing bowl, mix together sugar, buttermilk, oil, eggs, and vinegar. Add the dry mixture to the wet mixture and beat on medium speed until well blended. Add vanilla and entire bottle of red food coloring to batter and mix again on low speed until well blended and uniform in color. 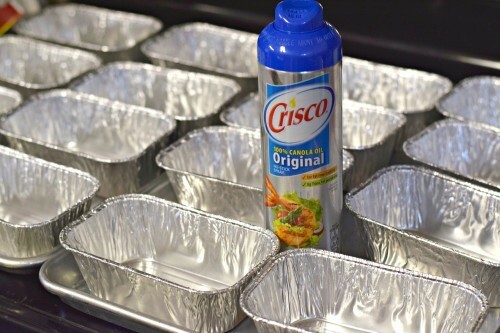 Spray 22 mini loaf pans with Crisco® cooking spray (see post for exact pan size). Place pans on baking sheets and add 1/2 cup of batter to each pan. Bake at 350 for 18-22 minutes, or until center springs back when pressed lightly with finger. Allow to cool completely before icing. Cream together cream cheese and butter. Add sugar and vanilla and beat with electric mixer until smooth and creamy, scraping down sides as needed. Ice cooled cakes. Can be left at room temp but I love it refrigerated! Oh wow. 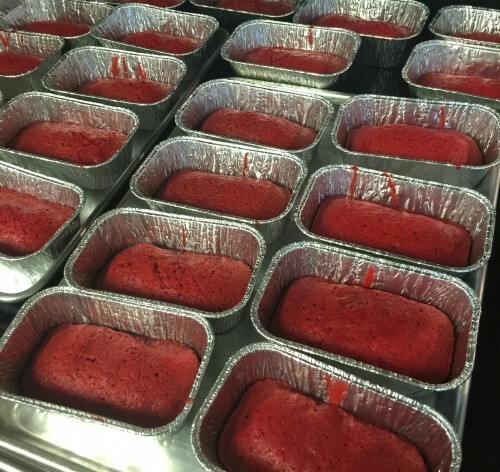 These red velvet cakes look marvelous. And conveniently small. I might end up eating three of those in one go, though. Have you tried bakers joy? Its a cooking spray with flour in. It can be found in the baking section at Wal-Mart and some grocery stores. I use it especially if I’m making a sheet cake using a mix. My mother used to use it all the time. I used it a few times when I first got married but found the plain old cooking sprays worked just as well for what I was making. It’s a great product, though! What a great idea Skye!!! I DONT LIKE RED VELVET CAKE ALL THAT FOOD COLORING TURNS ME OFF . AND ITS NOT GOOD FOR YOU. That’s the old RED DYE #2 .. the current coloring is safe!! My daughter cannot have any food coloring. So I just leave it out and have a ‘White Velvet’ cake, the flavor/taste is the same. Great thinking Angela!! Have a Merry Christmas!! How I wish I had found this recipe 2 weeks ago when I was planning what Food Gifts to make. Hi Christy, do these need to be refrigerated? If I give them out, but person doesn’t want to eat right away. Or if I make the day before giving out. Thanks, looks like a great treat. These were awesome I did half red and half green, they where a great success for a bakesale to benefit a family who’s young mom is battling breast cancer. Thank you for the wonderful recipe!!! Thank you Ruth, I am so glad they were enjoyed and helped to benefit someone in need!!! Hello ! Looking for clarification. The recipe calls to add an entire bottle of red food coloring but recipe says 2-1 ounce bottles. Thank you ! Merry Christmas ! Happy New Year ! is 2 teaspoons of cocoa powder really enough for that cocoa taste?